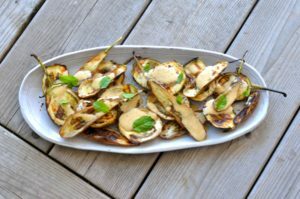 Here is a recipe to make use of the abundance of delicious eggplant available this time of year. i like to use petite heirloom eggplant such as fairy tale or Japanese for this recipe, although you can use the larger purple eggplant if that is what is available just slice lengthwise in 1/4 inch to 1/2 inch slices. This is a great side dish, I love serving with grilled baby lamb chops, especially if you use the same tahini sauce drizzled on top of your grilled chops. Sublime! From by the bay, wishing you yummy eggplant food memories! Whisk together tahini, lemon juice, 2 tablespoons olive oil, cumin, cayenne, and ¼ cup water until smooth. Add salt and pepper and whisk again. Cut eggplant into lengthwise slices, depending on your width you can cut in half or into widths of 1/4 inch to 1/2 inch. Coat with the additional olive oil. Grill on a medium heat until eggplant starts to brown 1 to 2 minutes and then flip to brown the other side. Pull off the heat and place on a platter. Sprinkle with salt and pepper and then drizzle with the tahini dressing. Garnish with chopped mint. Serve immediately or at room temperature within the hour. This entry was posted in side dish and tagged cayenne, cumin recipes, eggplant recipes, fairy tale eggplant, grilled eggplant with creamy tahini dressing, japanese eggplant, lemon recipes, tahini recipes, vegetarian recipes on August 11, 2016 by entertainingbythebay. 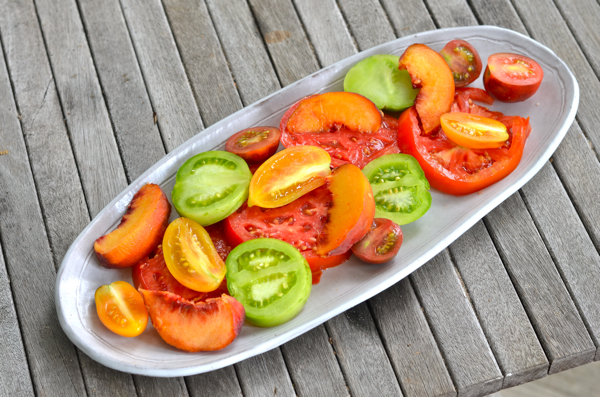 Heirloom tomatoes are not only delicious to eat, they are a true feast for the eyes. I love the wide variety of colors and shapes. I decided to deviate from my favorite salad of tomato, mozzarella and basil to this combination or tomato, peach, ricotta and tarragon. 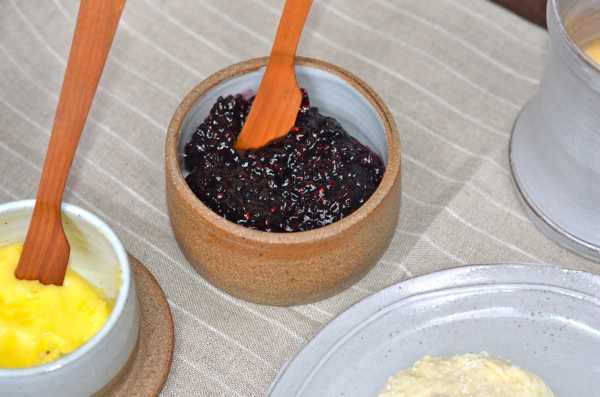 You will love this variation, especially if you find a good quality store bought ricotta cheese. 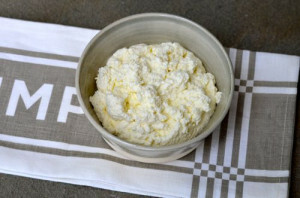 If you are ambitious try making your own ricotta cheese it’s really simple. My recipe is included below. I made my own ricotta for this salad because I had a large container of whole milk about to hit the expiration date. I didn’t want the milk to go to waste and I can’t think of a better use than making fresh ricotta cheese. The peaches add some sweetness to the salad and frying a few almonds in olive oil adds some needed crunch. This is a new favorite for my summer dining! From by the bay, wishing you sunny tomato and peach food memories! On large platter arrange the tomatoes and peaches. Dot the ricotta on top of the tomatoes and peaches. In a small skillet heat the olive oil and add the almonds. Stirred until almonds are heated and start to sizzle. Remove from heat and cool to room temperature before adding the sherry vinegar. Mix together. 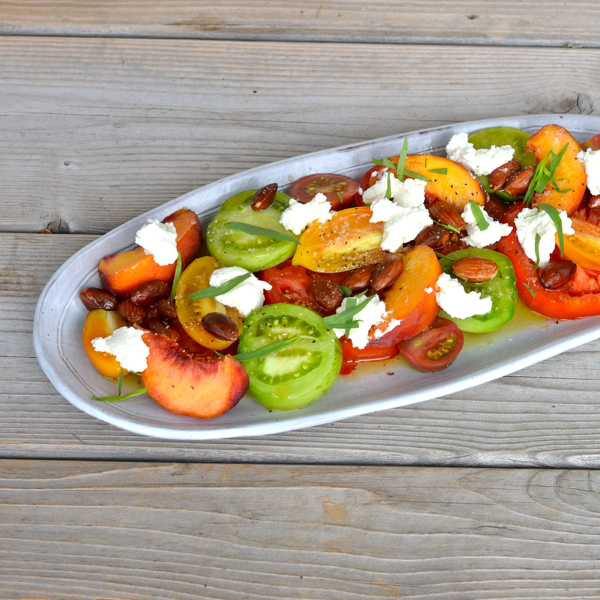 Drizzle dressing over the tomatoes and peaches. Dot the ricotta cheese on top. Add salt and pepper to taste. Sprinkle with tarragon leaves. Serve immediately. Line a sieve with a dampened cheesecloth and place over a bowl to strain the cheese. Place all the ingredients in a saucepan over medium heat. Bring to a full boil, stirring occasionally. The mixture will start to separate in curds ( the thick part that is the cheese) and whey ( the thin liquid you drain off). Once that happens, pour into the sieve, catching the ricotta into the cheesecloth lined sieve. Let stand for 20 to 25 minutes letting the liquid drain off. Let drain depending how thick and moist you want. the longer it drains the thicker and drier the ricotta. Once drained, take the cheese out of the cheesecloth and store in a container in the refrigerator until ready to use. This will stay 3 to 4 days. 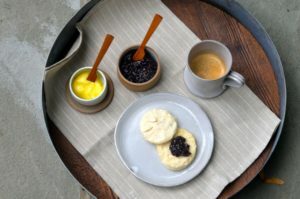 Variations – all good and I’ve made and enjoyed each one depending on the ingredients on hand. Use only whole milk for a slightly less creamy version, this is great if you don’t have any heavy cream. This entry was posted in side dish and tagged almond recipes, homemade ricotta cheese, homemade ricotta cheese recipe, ricotta cheese recipes, summer recipes, tarragon recipes, tomato recipes, tomatoes and peaches with ricotta and fried almonds on August 4, 2016 by entertainingbythebay.